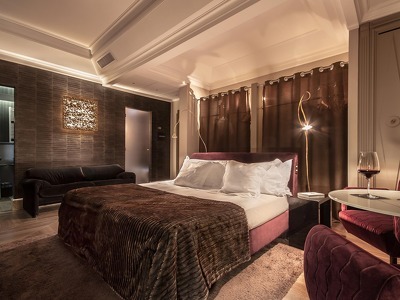 There are sixteen individually-styled rooms & suites at Hotel Palazzo Manfredi, each furnished with a mix of traditional Italian style and modern luxuries. Elegant print fabrics, large beds with plump pillows and fine linens, marble flooring and luxurious velvet and leather seating; everything has been designed with an eye on style & comfort. Relax in the luxurious king-size bed of the King De Luxe with its elegant fireplace or enjoy the views of the Colosseum & the Ludus Magnus from the Junior Suites which can sleep an extra guest if required.All rooms at this luxury hotel in Rome have individual temperature control, complimentary WiFi, digital Sky TV and Pay-per-view, mini-bars, coffee or Nespresso machines and in-room fitness machines on request. The designer marble bathrooms have bathtubs (apart from the Queen which has a shower), bathrobes, towels and luxurious Bulgari bath products. All rooms and suites apart from the classic rooms have HiFi Tivoli Audio systems and all rooms have Bang & Olufsen telephones. Rich velvets and leathers make these rooms a sophisticated oasis overlooking a quiet inner courtyard. Natural colours, soft lighting and wooden floors combine with unique pieces of furniture to create a cosy home-from-home. Every piece of furniture has been created by artists such as Ingo Maurer and Van Egmond, curtains and drapes in soft pastel shades of exquisite Dedar and Designers. The en-suite bathrooms have baths and showers. 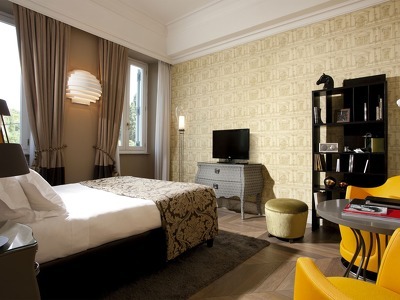 Stylish, comfortable and sophisticated, these rooms overlook the Domus Aurea and the park of Colle Oppio. 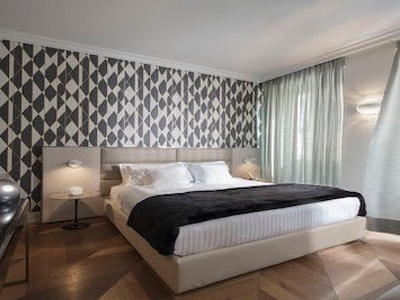 Beautiful wallpaper and contemporary furnishings blend with the parquet flooring. Every piece of furniture has been created by artists such as Ingo Maurer and Van Egmond, curtains and drapes in soft pastel shades of exquisite Dedar and Designers. The en-suite bathrooms have large glass showers. 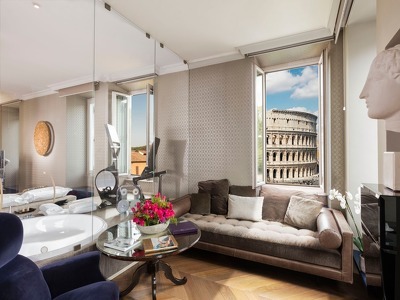 The Master rooms have an unforgettable view over the Colosseum. Every piece of furniture has been created by artists such as Ingo Maurer and VanEgmond, curtains and drapes in soft pastel shades of exquisite Dedar and Designers. The en-suite bathrooms have large glass showers. Elegant and sophisticated the Junior Suites have three large windows that overlook the Colosseum and the Ludus Magnus, the old gym where the gladiators used to train before their battle in the arena. The bathroom area is in the bedroom like a small Roman Baths, with a passing shower window from where you continue to admire the views. The use of vinyl wallpaper gives this room its own elegance, as well as the high-tech devices and surround audio system Parrot by Philippe Starck. You and your children will enjoy 2 adjoining bedrooms, with superb king-sized beds, and two en-suite bathrooms with glass showers. The style and atmosphere of this splendid setting complement the grandeur of the Eternal City. Velvets, drapes and gold lights by acclaimed contemporary designers create a bold statement. 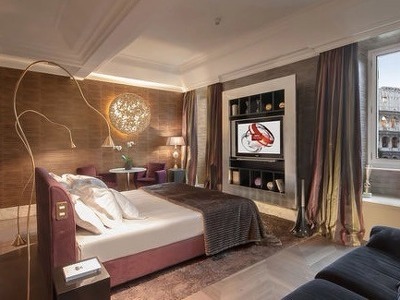 Elegant and sophisticated this stunning and dramatic suite overlooks the Colosseum and the Ludus Magnus. The suite has 3 windows overlooking the Colosseum and a nice cosy living room with a comfortable sofabed. The furnishings and fabrics and colours of velvet, bronze and purple, are inspired by the dwellings of ancient Rome. The bathroom area is in the bedroom like a small Roman Baths with a glass shower window from where you can continue to admire the Colosseum. The use of vinyl wallpaper gives this room its own elegance, as well as the high-tech devices and surround audio system Parrot by Philippe Starck. The Colosseum Suite features a separate sitting room and an upper level with bath, Jacuzzi, chromotherapy shower and gym. Fine fabrics such as velvet and leather, in natural shades blend smoothly beneath the soft glow of ceiling lamps, wood and tatami. Each one-of-a-kind piece is crafted by notable designers including Ingo Maurer and Van Egmond. Expect high-tech devices and surround audio system Parrot by Philippe Starck. 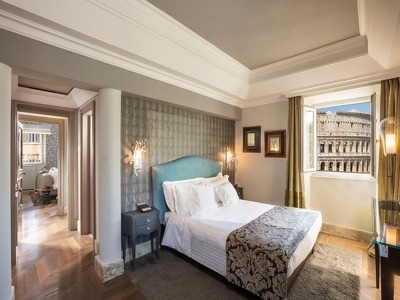 Hotel Palazzo Manfredi is a small boutique hotel in one of the most magnificent parts of Rome, with impressive views of the Colosseum, the Imperial Forum & the Domus Aurea villa. 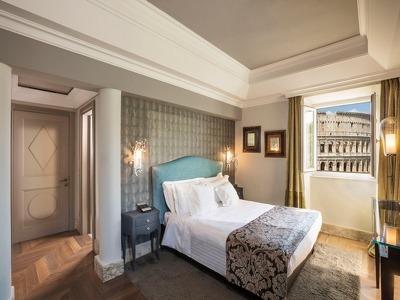 Enjoy this historical position in the heart of Rome in one of 16 spacious rooms & suites, decorated with a classic blend of Italian elegance and contemporary luxury. The roof terrace, built on former gladiatorial barracks, offers views over the Colosseum, and you can enjoy an evening cocktail or dinner from this exclusive roof garden and watch the city go by. Alternatively stay in one of 6 luxury apartments close by, perfect for families and groups of friends, offering independent accommodation with full hotel service. Located in the heart of historical Rome, you're within easy reach of the sites including the Domus Aurea and the Colosseum. San Giovanni and Santa Maria Maggiore are a few minutes away as is the famous archaeological site of the Palatine Hill. Rent a Vespa and explore the city like a local, or peruse the countless artisan and antique shops for some great souvenirs. To really explore in style you can rent the hotel's Lamborghini. This Chic Retreat can also arrange a personal fitness trainer who will devise a programme incorporating the sites of Ancient Rome to liven up your fitness regime. Of course, for relaxation, the roof terrace is a fine place to drink a cocktail or take tea. This charming hotel also collaborates with important city art galleries so that guests can enjoy famous artist's exhibitions in the property itself. Hotel Palazzo Manfredi serves an American breakfast buffet in the breakfast room or out on the roof terrace. Breakfast is also served in the apartments. Lunch, dinner and snacks are served in the rooms, the restaurant and out on the terrace and you can choose from the delicious Mediterranean menu. They also have a good selection of wines, champagne and cocktails. There are some great restaurants in the area for lunch and dinner. BY TRAIN: Rome’s main railway station, the Termini Station, is just a five-minute taxi ride from the hotel. Rome has two international airports with excellent links to the city. From Ciampino, the smaller of the two, you can take a taxi to the hotel while from Fiumicino airport, as well as taxis there is a shuttle train which runs between the airport and the central Termini station. There are sixteen individually-styled rooms & suites at Hotel Palazzo Manfredi, each furnished with a mix of traditional Italian style and modern luxuries. Elegant print fabrics, large beds with plump pillows and fine linens, marble flooring and luxurious velvet and leather seating; everything has been designed with an eye on style & comfort. Relax in the luxurious king-size bed of the King De Luxe with its elegant fireplace or enjoy the views of the Colosseum & the Ludus Magnus from the Junior Suites which can sleep an extra guest if required. All rooms at this luxury hotel in Rome have individual temperature control, complimentary WiFi, digital Sky TV and Pay-per-view, mini-bars, coffee or Nespresso machines and in-room fitness machines on request. The designer marble bathrooms have bathtubs (apart from the Queen which has a shower), bathrobes, towels and luxurious Bulgari bath products. All rooms and suites apart from the classic rooms have HiFi Tivoli Audio systems and all rooms have Bang & Olufsen telephones. You know that the hotel is supremely good when it’s the best thing in your trip to the city, and even though Rome is a great city to visit choosing this hotel was the best thing we did on that trip, I write this review after two years of my visit to the hotel and still me and my wife reminisce about this hotel and how mesmerized we were with it. Though at the time of the stay they upgraded our room to a sweet for taking the romantic package when we made our reservation. It is hard to express how lovely this hotel is. The location is perfect, overlooking the Colosseum itself, and within walking distance of the city centre. If you are not lucky enough to book a room overlooking the Colosseum don't worry, you will see it from the restaurant over breakfast or dinner. The hotel's staff are incredibly helpful and friendly, and cannot do enough for you to make your stay special. Our room was beautiful, food and drink great, and plenty of local authentic places to eat within a 5 minute walk. A wonderful experience. Great Hotel with an incredible location to the Colosseum. The breakfast each morning is AMAZING. The view from the restaurant is like being in a movie and they serve eggs to order, bacon, a variety of breads, cheeses, pastries and they are wonderful. Rooms are very nice and comfortable and the staff is very kind and welcoming. Highly recommend this hotel. Beautiful building and incredible views from rooftop restaurant overlooking the Colosseum and ruins. The staff is exceptional and willing to accommodate any requests. Highly recommended to travelers looking to up their experience in Rome. Difficult not to be wowed by the experience. Will be staying again.